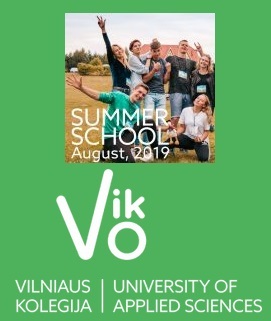 Vilniaus kolegija / University of Applied Sciences is inviting international students to Summer School which will take place in August, 2019. The Summer School is open for the college, short-cycle, undergraduate students, who finished at least one year of their studies, or postgraduate students. We welcome everyone interested into improving their professional knowledge and skills. Moreover, it will be great opportunity to improve English language skills, as well as to explore Lithuania and its culture. The programme also allows student to take home 3 ECTS under the European Credit Transfer Scheme. The Summer School will be hosted at our campuses, which are located in the green area on the edge of Vilnius. The programme include visits to the companies. The participation covers registration, tuition, certificates, accommodation in the student hostel, local transport tickets, meals (breakfasts and lunches), and the social programme.